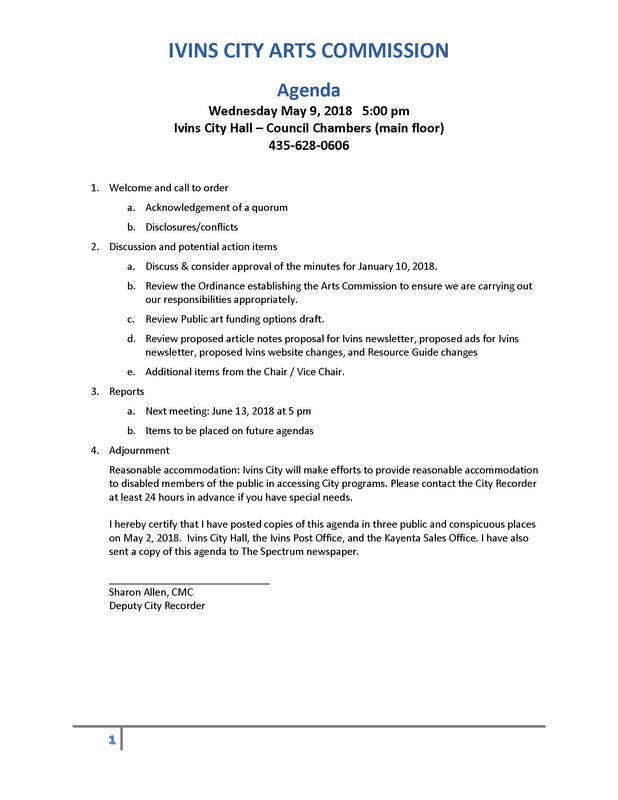 The Ivins City Arts Commission consists of seven members appointed by the City Council. A majority of members are to reside in Ivins and have, in the aggregate, broad experience and expertise in the arts and/or arts organization management and such other characteristics valued by the City Council. 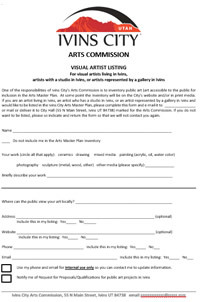 [Click here] for a list of the members of the Arts Commission. 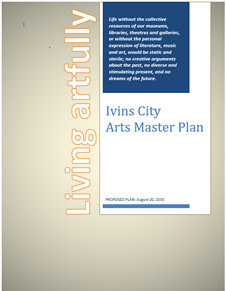 With the creation of this Arts Master Plan, Ivins residents and policy makers are setting forth the goals and expectations for the City as it works with developers, businesses, artists, and others to maintain and enhance the reputation and experience of Ivins City as a place for living artfully. Publishing this Arts Master Plan online allows residents and travelers the opportunity to understand the significance of the arts to the present and future of Ivins City. Recommend to the City Council how the Arts Master Plan can best be implemented. 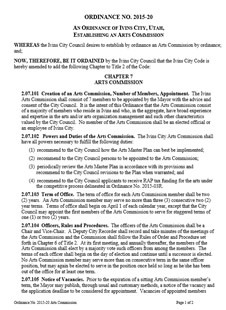 Recommend to the City Council persons to be appointed to the Arts Commission. 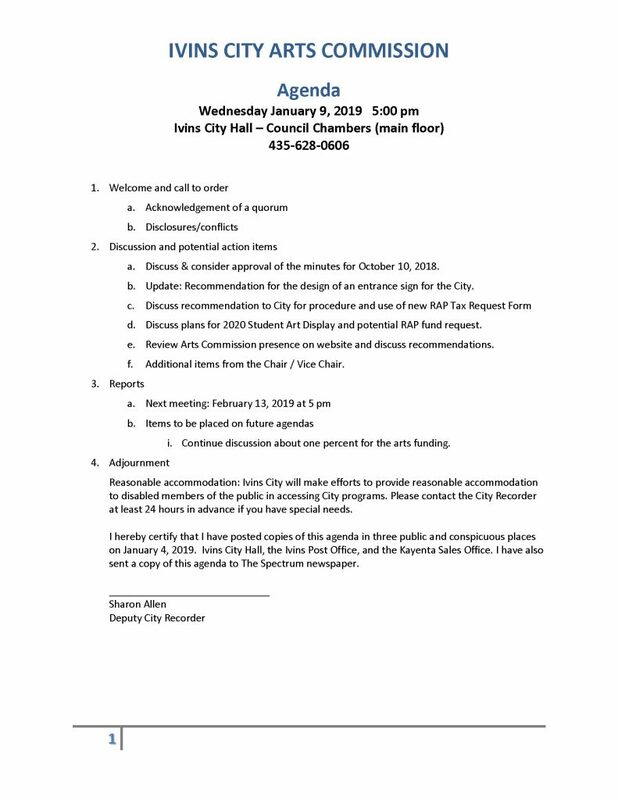 Periodically review the Arts Master Plan in accordance with its provisions and recommend to the City Council revisions to the Plan when warranted. 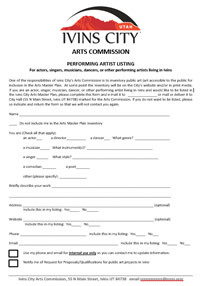 Recommend to the City Council applicants to receive RAP tax funding for the arts. One of the responsibilities of Ivins City’s Arts Commission is to inventory public art (art accessible to the public for inclusion in the Arts Master Plan. 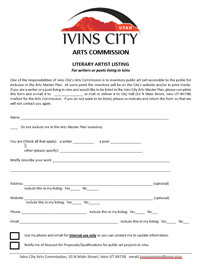 If you are an artist and would like to be listed in the Ivins City Arts Master Plan, please complete the appropriate form below an email it to IvinsArtsCommission@gmail.com or leave it at City Hall marked for the Arts Commission.